Holiday Inn Express & Suites Tremblant, formerly know as the The Kandahar and Country Inn & Suites, features cosy hotel rooms and spacious suites make good choice for people looking to be in the lively part of Tremblant with array of bars, clubs and restaurants to choose from in Le Vieux Tremblant (Old Town). 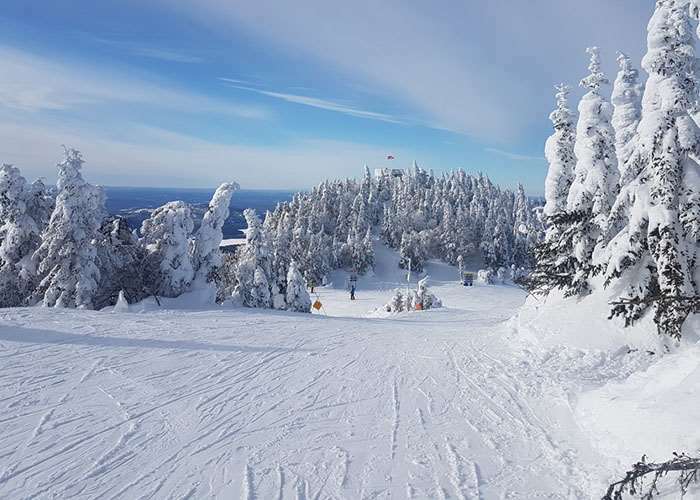 Location Situated in Vieux Tremblant, 1 minute’s walk (100m) to the Le Cabriolet gondola and a short walk to the shops, bars, clubs and restaurants of Tremblant Village. Hotel room (A4) 20m² - sleeps 1-4 Double bed and double sofa bed, coffee maker, microwave, mini-fridge; bath and shower and hairdryer. 1 Bedroom Apartment (B6) 48m² - sleeps 2-6 Bedroom with one queen or two double beds, living room with double sofa bed, fireplace, telephone, TV, full kitchen with dishwasher, bath, shower and hairdryer. The price shown includes 7 nights accommodation, with flights from Glasgow.